Keyword Search Result for "Doug Macdougall"
This is what a headline read of the New York Times on March 11, 1907. 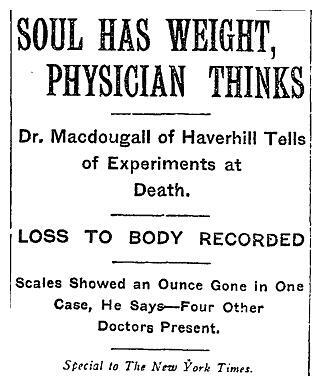 Dr. Duncan MacDougall from Haverhill, Massachusetts, had placed barely living subjects on a bed which constantly weighed them as they slipped into death. MacDougall felt that the soul was material and had mass, therefore it could be measured. Page created in 0.094 seconds with 86 queries.